I’ll have to try these. My oven is completely blocked by furniture, so I am looking forward to having my kitchen back by the weekend. hello weekend here I come these look and sound DELISH. Ooh that looks amazing! Thanks for the recipe and the extra workouts. Brownies for breakfast, check. 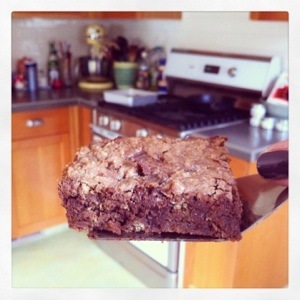 Brownies for lunch, check. Brownies for dinner, check. Brownies before bed, check! I missed this post! These are very like what I call “Joyce bars”, after my mother who used to make them. Our recipe is somewhat simpler though. 1 can of condensed milk, 1 bag of semi-sweet chips and 1.5 cups of graham cracker flour. (My other name for them is 1/1/1.5 bars, so I can remember the ratio of ingredients!) I may have to try your recipe though, to see what the cocoa powder and baking soda do. They are long-time favorites in my family. My teen-aged nephew even learned how to make them after I gave him a batch!